(Xinhua) The top 10 ‘American Idol’ contestants know how they’re spending their summer vacation: on a nationwide concert tour kicking off in July in Oregon. Tickets for the 50-city tour will go on sale May 9, tour organizers said. The tour is set to begin July 5 in Portland, Ore., then hopscotch to California, Texas, Oklahoma, Florida, New York and Pennsylvania before ending in New Hampshire in September. 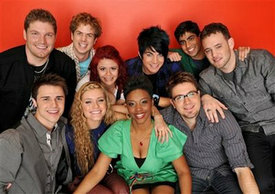 Details are available at http://www.americanidol.com. Finalists on the tour are Adam Lambert, Allison Iraheta, Anoop Desai, Danny Gokey, Kris Allen, Lil Rounds, Matt Giraud, Megan Joy, Michael Sarver and Scott MacIntyre. The Fox singing contest has pared the field down to seven contestants, with the winner to be crowned on the May 20 finale. Joy, Sarver and MacIntyre have been voted off by viewers. Giraud was spared the ax when judges used their one-time ‘save’ and kept him on the show.